Plans that are not simple enough to be issued ‘over the counter’ are taken in for routing and review. To have your project reviewed, bring your completed [Building Permit Application] form, plans including additional materials, and required fees to the Permit Service Center. The City of Ruston currently collects fees at the time of permit issuance on building permits. All other permit applications require a review fee deposit to be paid at the time of application submittal. Contact the permit service center at (253) 759-3544 ext 105 to determine the required permits needed and the applicable fees due. Subsequently, when review fees are paid or a complete application is submitted, your project application status is changed to “Under Review,” and within 1-2 working days your plans are assigned to review groups. A checksheet is sent when a reviewer needs additional information or a correction needs to be made to the plans. Once the reviewer sends a checksheet, they take no further action until you provide a response to the checksheet. 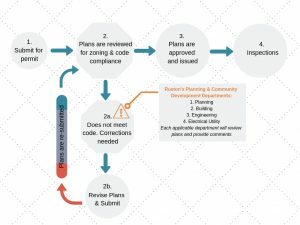 Some applications will require a complete plans review analysis. If a letter is composed by a plans reviewer it will accompany the checksheet. Once you receive a checksheet and have gathered the additional information or made the corrections, bring the information to the Development Services Center. Complete and timely responses will speed the re-review of the project. More tips on how to respond to a checksheet. If the checksheet response is complete, the reviewer will sign off and the proposal will move to the next review group (see step 3). If the reviewer needs additional information or has identified corrections to the proposal, they will request this information from you in writing in another checksheet (return to steps 2a and 2b). When the last technical review is approved, your permit will be pre issued. You will be notified that your permit is ready, and be provided an invoice for review fee total. You may pick up your permit between 9:00 am-2:00 pm Monday through Friday, at the Permit Service Center, located within City Hall at 5117 N Winnifred Street Ruston, WA 98407. When you pick up your permit, you will receive a building perm inspection placard listing all of the inspections you will need during construction. When all of your inspections are approved, you will receive a final inspection and your project is complete.